Classically trained, Édouard Manet saw himself in the tradition of the Great Masters, but he was a hero to the young rebels soon to be known as the Impressionists because he translated academic art into a wholly modern aesthetic. In his work, he portrayed contemporary life candidly and never blinked at reality or compromised his highly original vision. 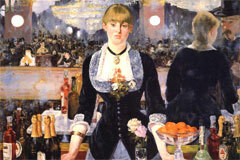 Shocking the art world of the 19th Century, Manet submitted paintings to the Paris Salon that caused great controversy and were reviled by the critics. Today they are considered works that marked the birth of modern art.